The beauty industry is fast paced, and time wasted means money wasted; so, in order to save time it is important to have all the necessary products at a hand’s reach. 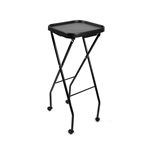 Beauticians, hair dressers and makeup artists alike know the importance of having a utility tray close by. Being on rolling casters it is an important cart that can be moved from station to station with ease and can hold necessary products such as makeup and makeup brushes, hair dyes and foils, scissors and other hair implements, blow dryers, hair irons, and other beauty supplies and hair accessories. In a sense, a salon tray can take the place of a personal assistant. Source One Beauty carries plastic trays, metal trays, wood trays, trays with removable tops for easy cleaning, and even trays with drawers. Select one of our many trays that will fit your needs and see the benefits of having a personal assistant.